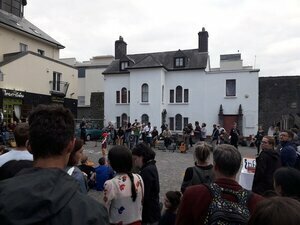 Amazing crowd at Spanish Arch to support the #Galway buskers, who fear that new bye-laws will drive them out of the city. Posted in Misc and tagged Galway, street entertainers at 9:05 am on May 28, 2018 by Chompsky. Galway city council seem to hate their city. I was under the impression that the new law was only to prevent buskers using amplification during the day (9-6). Surely this allows more buskers on a given street as they aren’t competing on volume? Some of the gobdaw buskers on Grafton Street should be hung, drawn and quartered (as a tribute to crowd tittilation). SO LOUD.